Copyright © 2013-2016 David Vossel. The text of and illustrations in this document are licensed under version 4.0 or later of the Creative Commons Attribution-ShareAlike International Public License ("CC-BY-SA"). In accordance with CC-BY-SA, if you distribute this document or an adaptation of it, you must provide the URL for the original version. Finally, while it is not mandatory under this license, it is considered good form to offer a free copy of any hardcopy or CD-ROM expression of the author(s) work. The document exists as both a reference and deployment guide for the Pacemaker Remote service. The concepts are the same for other distributions, virtualization platforms, toolsets, and messaging layers, and should be easily adaptable. 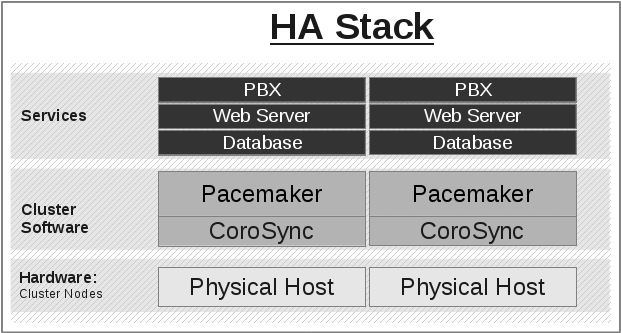 In a basic Pacemaker high-availability cluster, each node runs the full cluster stack of corosync and all Pacemaker components. This allows great flexibility but limits scalability to around 16 nodes. To allow for scalability to dozens or even hundreds of nodes, Pacemaker allows nodes not running the full cluster stack to integrate into the cluster and have the cluster manage their resources as if they were a cluster node. A node running the full high-availability stack of corosync and all Pacemaker components. Cluster nodes may run cluster resources, run all Pacemaker command-line tools (crm_mon, crm_resource and so on), execute fencing actions, count toward cluster quorum, and serve as the cluster’s Designated Controller (DC). A small service daemon that allows a host to be used as a Pacemaker node without running the full cluster stack. Nodes running pacemaker_remote may run cluster resources and most command-line tools, but cannot perform other functions of full cluster nodes such as fencing execution, quorum voting or DC eligibility. The pacemaker_remote daemon is an enhanced version of Pacemaker’s local resource management daemon (LRMD). A physical host running pacemaker_remote. Remote nodes have a special resource that manages communication with the cluster. This is sometimes referred to as the baremetal case. A virtual host running pacemaker_remote. Guest nodes differ from remote nodes mainly in that the guest node is itself a resource that the cluster manages. Remote in this document refers to the node not being a part of the underlying corosync cluster. It has nothing to do with physical proximity. Remote nodes and guest nodes are subject to the same latency requirements as cluster nodes, which means they are typically in the same data center. A virtual machine can run the full cluster stack, in which case it is a cluster node and is not itself managed by the cluster. A virtual machine can be managed by the cluster as a resource, without the cluster having any awareness of the services running inside the virtual machine. The virtual machine is opaque to the cluster. A virtual machine can be a cluster resource, and run pacemaker_remote to make it a guest node, allowing the cluster to manage services inside it. The virtual machine is transparent to the cluster. If pacemaker_remote is stopped on an active node, it will wait for the cluster to migrate all resources off before exiting, rather than exit immediately and get fenced. "I want a Pacemaker cluster to manage virtual machine resources, but I also want Pacemaker to be able to manage the resources that live within those virtual machines." The cluster stack could be run on the physical hosts only, which loses the ability to monitor resources within the guests. A separate cluster could be on the virtual guests, which quickly hits scalability issues. The cluster stack could be run on the guests using the same cluster as the physical hosts, which also hits scalability issues and complicates fencing. The physical hosts are cluster nodes (running the full cluster stack). The virtual machines are guest nodes (running the pacemaker_remote service). Nearly zero configuration is required on the virtual machine. The cluster stack on the cluster nodes launches the virtual machines and immediately connects to the pacemaker_remote service on them, allowing the virtual machines to integrate into the cluster. The key difference here between the guest nodes and the cluster nodes is that the guest nodes do not run the cluster stack. This means they will never become the DC, initiate fencing actions or participate in quorum voting. On the other hand, this also means that they are not bound to the scalability limits associated with the cluster stack (no 16-node corosync member limits to deal with). That isn’t to say that guest nodes can scale indefinitely, but it is known that guest nodes scale horizontally much further than cluster nodes. Other than the quorum limitation, these guest nodes behave just like cluster nodes with respect to resource management. The cluster is fully capable of managing and monitoring resources on each guest node. You can build constraints against guest nodes, put them in standby, or do whatever else you’d expect to be able to do with cluster nodes. They even show up in crm_mon output as nodes. With this deployment, you would have 64 webservers and databases running on 64 virtual machines on 16 hardware nodes, all of which are managed and monitored by the same Pacemaker deployment. It is known that pacemaker_remote can scale to these lengths and possibly much further depending on the specific scenario. "I want my traditional high-availability cluster to scale beyond the limits imposed by the corosync messaging layer." Ultimately, the primary advantage of remote nodes over cluster nodes is scalability. There are likely some other use cases related to geographically distributed HA clusters that remote nodes may serve a purpose in, but those use cases are not well understood at this point. Like guest nodes, remote nodes will never become the DC, initiate fencing actions or participate in quorum voting. That is not to say, however, that fencing of a remote node works any differently than that of a cluster node. The Pacemaker policy engine understands how to fence remote nodes. As long as a fencing device exists, the cluster is capable of ensuring remote nodes are fenced in the exact same way as cluster nodes. If you already know how to use Pacemaker, you’ll likely be able to grasp this new concept of guest nodes by reading through this quick example without having to sort through all the detailed walk-through steps. Here are the key configuration ingredients that make this possible using libvirt and KVM virtual guests. These steps strip everything down to the very basics. Give each virtual machine that will be used as a guest node a static network address and unique hostname. Put the same authentication key with the path /etc/pacemaker/authkey on every cluster node and virtual machine. This secures remote communication. Install pacemaker_remote on every virtual machine, enabling it to start at boot, and if a local firewall is used, allow the node to accept connections on TCP port 3121. If you just want to see this work, you may want to simply disable the local firewall and put SELinux in permissive mode while testing. This creates security risks and should not be done on a production machine exposed to the Internet, but can be appropriate for a protected test machine. Create a Pacemaker resource to launch each virtual machine, using the remote-node meta-attribute to let Pacemaker know this will be a guest node capable of running resources. # pcs resource create vm-guest1 VirtualDomain hypervisor="qemu:///system" config="vm-guest1.xml" meta remote-node="guest1"
In the example above, the meta-attribute remote-node="guest1" tells Pacemaker that this resource is a guest node with the hostname guest1. The cluster will attempt to contact the virtual machine’s pacemaker_remote service at the hostname guest1 after it launches. The ID of the resource creating the virtual machine (vm-guest1 in the above example) must be different from the virtual machine’s uname (guest1 in the above example). Pacemaker will create an implicit internal resource for the pacemaker_remote connection to the guest, named with the value of remote-node, so that value cannot be used as the name of any other resource. It is worth noting that after guest1 is integrated into the cluster, nearly all the Pacemaker command-line tools immediately become available to the guest node. This means things like crm_mon, crm_resource, and crm_attribute will work natively on the guest node, as long as the connection between the guest node and a cluster node exists. This is particularly important for any master/slave resources executing on the guest node that need access to crm_master to set transient attributes. The walk-through examples use some of these options, but don’t explain exactly what they mean or do. This section is meant to be the go-to resource for all the options available for configuring pacemaker_remote-based nodes. When configuring a virtual machine as a guest node, the virtual machine is created using one of the usual resource agents for that purpose (for example, ocf:heartbeat:VirtualDomain or ocf:heartbeat:Xen), with additional metadata parameters. No restrictions are enforced on what agents may be used to create a guest node, but obviously the agent must create a distinct environment capable of running the pacemaker_remote daemon and cluster resources. An additional requirement is that fencing the host running the guest node resource must be sufficient for ensuring the guest node is stopped. This means, for example, that not all hypervisors supported by VirtualDomain may be used to create guest nodes; if the guest can survive the hypervisor being fenced, it may not be used as a guest node. Below are the metadata options available to enable a resource as a guest node and define its connection parameters. The node name of the guest node this resource defines. This both enables the resource as a guest node and defines the unique name used to identify the guest node. If no other parameters are set, this value will also be assumed as the hostname to use when connecting to pacemaker_remote on the VM. This value must not overlap with any resource or node IDs. The port on the virtual machine that the cluster will use to connect to pacemaker_remote. The IP address or hostname to use when connecting to pacemaker_remote on the VM. How long before a pending guest connection will time out. A remote node is defined by a connection resource. That connection resource has instance attributes that define where the remote node is located on the network and how to communicate with it. server: Server location to connect to. This can be an ip address or hostname. port: tcp port to connect to. When defining a remote node’s connection resource, it is common and recommended to name the connection resource the same as the remote node’s hostname. By default, if no server option is provided, the cluster will attempt to contact the remote node using the resource name as the hostname. Authentication and encryption of the connection between cluster nodes and nodes running pacemaker_remote is achieved using with TLS-PSK encryption/authentication over TCP (port 3121 by default). This means that both the cluster node and remote node must share the same private key. By default, this key is placed at /etc/pacemaker/authkey on each node. You can change the default port and/or key location for Pacemaker and pacemaker_remote via environment variables. How these variables are set varies by OS, but usually they are set in the /etc/sysconfig/pacemaker or /etc/default/pacemaker file. If the resource creating a guest node, or the ocf:pacemaker:remote resource creating a connection to a remote node, is removed from the configuration, the affected node will continue to show up in output as an offline node. Be absolutely sure that there are no references to the node’s resource in the configuration before running the above command. What this tutorial is: An in-depth walk-through of how to get Pacemaker to manage a KVM guest instance and integrate that guest into the cluster as a guest node. What this tutorial is not: A realistic deployment scenario. The steps shown here are meant to get users familiar with the concept of guest nodes as quickly as possible. For this example, we will use a single physical host named example-host. A production cluster would likely have multiple physical hosts, in which case you would run the commands here on each one, unless noted otherwise. If you are using iptables directly, or some other firewall solution besides firewalld, simply open the following ports, which can be used by various clustering components: TCP ports 2224, 3121, and 21064, and UDP port 5405. If you run into any problems during testing, you might want to disable the firewall and SELinux entirely until you have everything working. This may create significant security issues and should not be performed on machines that will be exposed to the outside world, but may be appropriate during development and testing on a protected host. Corosync handles pacemaker’s cluster membership and messaging. The corosync config file is located in /etc/corosync/corosync.conf. That config file must be initialized with information about the cluster nodes before pacemaker can start. If you have multiple physical hosts, you would execute the setup command on only one host, but list all of them at the end of the command. If you have multiple physical hosts, you would generate the key on only one host, and copy it to the same location on all hosts. Now, enable the cluster to work without quorum or stonith. This is required for the sake of getting this tutorial to work with a single cluster node. The use of stonith-enabled=false is completely inappropriate for a production cluster. It tells the cluster to simply pretend that failed nodes are safely powered off. Some vendors will refuse to support clusters that have STONITH disabled. We disable STONITH here only to focus the discussion on pacemaker_remote, and to be able to use a single physical host in the example. Go ahead and stop the cluster for now after verifying everything is in order. 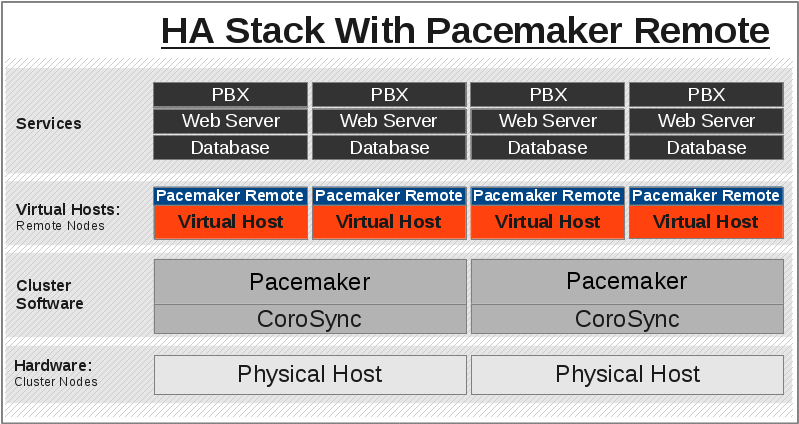 While KVM is used in this example, any virtualization platform with a Pacemaker resource agent can be used to create a guest node. The resource agent needs only to support usual commands (start, stop, etc. ); Pacemaker implements the remote-node meta-attribute, independent of the agent. We will not outline here the installation steps required to create a KVM guest. There are plenty of tutorials available elsewhere that do that. Just be sure to configure the guest with a hostname and a static IP address (as an example here, we will use guest1 and 192.168.122.10). On each guest, allow cluster-related services through the local firewall, following the same procedure as in Section 4.1.1, “Configure Firewall on Host”. At this point, you should be able to ping and ssh into guests from hosts, and vice versa. Install pacemaker_remote, and enable it to run at start-up. Here, we also install the pacemaker package; it is not required, but it contains the dummy resource agent that we will use later for testing. Mar 14 18:24:04 guest1 systemd: Started Pacemaker Remote Service. Mar 14 18:24:04 guest1 pacemaker_remoted: notice: lrmd_init_remote_tls_server: Starting a tls listener on port 3121. Before moving forward, it’s worth verifying that the host can contact the guest on port 3121. Here’s a trick you can use. Connect using ssh from the host. The connection will get destroyed, but how it is destroyed tells you whether it worked or not. First add guest1 to the host machine’s /etc/hosts file if you haven’t already. This is required unless you have DNS setup in a way where guest1’s address can be discovered. Once you can successfully connect to the guest from the host, shutdown the guest. Pacemaker will be managing the virtual machine from this point forward. Now the fun part, integrating the virtual machine you’ve just created into the cluster. It is incredibly simple. On the host, start pacemaker. Wait for the host to become the DC. The output of pcs status should look as it did in Section 4.1.6, “Disable STONITH and Quorum”. We will use the VirtualDomain resource agent for the management of the virtual machine. This agent requires the virtual machine’s XML config to be dumped to a file on disk. To do this, pick out the name of the virtual machine you just created from the output of this list. In my case I named it guest1. Dump the xml to a file somewhere on the host using the following command. Now just register the resource with pacemaker and you’re set! This example puts the guest XML under /etc/pacemaker because the permissions and SELinux labeling should not need any changes. If you run into trouble with this or any step, try disabling SELinux with setenforce 0. If it works after that, see SELinux documentation for how to troubleshoot, if you wish to reenable SELinux. Pacemaker will automatically monitor pacemaker_remote connections for failure, so it is not necessary to create a recurring monitor on the VirtualDomain resource. Once the vm-guest1 resource is started you will see guest1 appear in the pcs status output as a node. The final pcs status output should look something like this. The commands below demonstrate how resources can be executed on both the guest node and the cluster node. Create a few Dummy resources. Dummy resources are real resource agents used just for testing purposes. They actually execute on the host they are assigned to just like an apache server or database would, except their execution just means a file was created. When the resource is stopped, that the file it created is removed. Now check your pcs status output. In the resource section, you should see something like the following, where some of the resources started on the cluster node, and some started on the guest node. The guest node, guest1, reacts just like any other node in the cluster. For example, pick out a resource that is running on your cluster node. For my purposes, I am picking FAKE3 from the output above. We can force FAKE3 to run on guest1 in the exact same way we would any other node. Now, looking at the bottom of the pcs status output you’ll see FAKE3 is on guest1. Pacemaker’s policy engine is smart enough to know fencing guest nodes associated with a virtual machine means shutting off/rebooting the virtual machine. No special configuration is necessary to make this happen. If you are interested in testing this functionality out, trying stopping the guest’s pacemaker_remote daemon. This would be equivalent of abruptly terminating a cluster node’s corosync membership without properly shutting it down. ssh into the guest and run this command. Within a few seconds, your pcs status output will show a monitor failure, and the guest1 node will not be shown while it is being recovered. A guest node involves two resources: the one you explicitly configured creates the guest, and Pacemaker creates an implicit resource for the pacemaker_remote connection, which will be named the same as the value of the remote-node attribute of the explicit resource. When we killed pacemaker_remote, it is the implicit resource that failed, which is why the failed action starts with guest1 and not vm-guest1. Once recovery of the guest is complete, you’ll see it automatically get re-integrated into the cluster. The final pcs status output should look something like this. Besides allowing the cluster to manage resources on a guest node, pacemaker_remote has one other trick. The pacemaker_remote daemon allows nearly all the pacemaker tools (crm_resource, crm_mon, crm_attribute, crm_master, etc.) to work on guest nodes natively. Try it: Run crm_mon on the guest after pacemaker has integrated the guest node into the cluster. These tools just work. This means resource agents such as master/slave resources which need access to tools like crm_master work seamlessly on the guest nodes. Higher-level command shells such as pcs may have partial support on guest nodes, but it is recommended to run them from a cluster node. What this tutorial is: An in-depth walk-through of how to get Pacemaker to integrate a remote node into the cluster as a node capable of running cluster resources. What this tutorial is not: A realistic deployment scenario. The steps shown here are meant to get users familiar with the concept of remote nodes as quickly as possible. This tutorial requires three machines: two to act as cluster nodes, and a third to act as the remote node. Install the pacemaker_remote daemon on the remote node. Now start and enable the pacemaker_remote daemon on the remote node. Verify the start is successful. Aug 21 15:21:20 remote1 systemd: Started Pacemaker Remote Service. Aug 21 15:21:20 remote1 pacemaker_remoted: notice: lrmd_init_remote_tls_server: Starting a tls listener on port 3121. Before moving forward, it’s worth verifying that the cluster nodes can contact the remote node on port 3121. Here’s a trick you can use. Connect using ssh from each of the cluster nodes. The connection will get destroyed, but how it is destroyed tells you whether it worked or not. First, add the remote node’s hostname (we’re using remote1 in this tutorial) to the cluster nodes' /etc/hosts files if you haven’t already. This is required unless you have DNS set up in a way where remote1’s address can be discovered. Execute the following on each cluster node, replacing the IP address with the actual IP address of the remote node. Once you can successfully connect to the remote node from the both cluster nodes, move on to setting up Pacemaker on the cluster nodes. On each cluster node, allow cluster-related services through the local firewall, following the same procedure as in Section 5.1.1, “Configure Firewall on Remote Node”. On the two cluster nodes, install the following packages. Corosync handles Pacemaker’s cluster membership and messaging. The corosync config file is located in /etc/corosync/corosync.conf. That config file must be initialized with information about the two cluster nodes before pacemaker can start. To initialize the corosync config file, execute the following pcs command on both nodes, filling in the information in <> with your nodes' information. Start the cluster stack on both cluster nodes using the following command. Verify Pacemaker status. At first, the pcs cluster status output will look like this. After about a minute, you should see your two cluster nodes come online. For the sake of this tutorial, we are going to disable stonith to avoid having to cover fencing device configuration. Integrating a remote node into the cluster is achieved through the creation of a remote node connection resource. The remote node connection resource both establishes the connection to the remote node and defines that the remote node exists. Note that this resource is actually internal to Pacemaker’s crmd component. A metadata file for this resource can be found in the /usr/lib/ocf/resource.d/pacemaker/remote file that describes what options are available, but there is no actual ocf:pacemaker:remote resource agent script that performs any work. Define the remote node connection resource to our remote node, remote1, using the following command on any cluster node. That’s it. After a moment you should see the remote node come online. Once the remote node is integrated into the cluster, starting resources on a remote node is the exact same as on cluster nodes. Refer to the Clusters from Scratch document for examples of resource creation. Never involve a remote node connection resource in a resource group, colocation constraint, or order constraint. Remote nodes are fenced the same way as cluster nodes. No special considerations are required. Configure fencing resources for use with remote nodes the same as you would with cluster nodes. Note, however, that remote nodes can never initiate a fencing action. Only cluster nodes are capable of actually executing a fencing operation against another node. Besides allowing the cluster to manage resources on a remote node, pacemaker_remote has one other trick. The pacemaker_remote daemon allows nearly all the pacemaker tools (crm_resource, crm_mon, crm_attribute, crm_master, etc.) to work on remote nodes natively. Try it: Run crm_mon on the remote node after pacemaker has integrated it into the cluster. These tools just work. These means resource agents such as master/slave resources which need access to tools like crm_master work seamlessly on the remote nodes. Higher-level command shells such as pcs may have partial support on remote nodes, but it is recommended to run them from a cluster node. These alternative configurations may be appropriate in limited cases, such as a test cluster, but are not the best method in most situations. They are presented here for completeness and as an example of Pacemaker’s flexibility to suit your needs. The preferred use of virtual machines in a Pacemaker cluster is as a cluster resource, whether opaque or as a guest node. However, it is possible to run the full cluster stack on a virtual node instead. This is commonly used to set up test environments; a single physical host (that does not participate in the cluster) runs two or more virtual machines, all running the full cluster stack. This can be used to simulate a larger cluster for testing purposes. In a production environment, fencing becomes more complicated, especially if the underlying hosts run any services besides the clustered VMs. If the VMs are not guaranteed a minimum amount of host resources, CPU and I/O contention can cause timing issues for cluster components. Another situation where this approach is sometimes used is when the cluster owner leases the VMs from a provider and does not have direct access to the underlying host. The main concerns in this case are proper fencing (usually via a custom resource agent that communicates with the provider’s APIs) and maintaining a static IP address between reboots, as well as resource contention issues. Virtual machines may be configured following the process for remote nodes rather than guest nodes (i.e., using an ocf:pacemaker:remote resource rather than letting the cluster manage the VM directly). This is mainly useful in testing, to use a single physical host to simulate a larger cluster involving remote nodes. Pacemaker’s Cluster Test Suite (CTS) uses this approach to test remote node functionality. Containers, and in particular Linux containers (LXC) and Docker, have become a popular method of isolating services in a resource-efficient manner. The preferred means of integrating containers into Pacemaker is as a cluster resource, whether opaque or using Pacemaker’s bundle resource type. However, it is possible to run pacemaker_remote inside a container, following the process for guest nodes. This is not recommended but can be useful, for example, in testing scenarios, to simulate a large number of guest nodes. The underlying host must install the libvirt driver for the desired container technology — for example, the libvirt-daemon-lxc package to get the libvirt-lxc driver for LXC containers. Libvirt XML definitions must be generated for the containers. The pacemaker-cts package includes a script for this purpose, /usr/share/pacemaker/tests/cts/lxc_autogen.sh. Run it with the --help option for details on how to use it. It is intended for testing purposes only, and hardcodes various parameters that would need to be set appropriately in real usage. Of course, you can create XML definitions manually, following the appropriate libvirt driver documentation. To share the authentication key, either share the host’s /etc/pacemaker directory with the container, or copy the key into the container’s filesystem. The VirtualDomain resource for a container will need force_stop="true" and an appropriate hypervisor option, for example hypervisor="lxc:///" for LXC containers.